Kim Bowling, L.D.O. 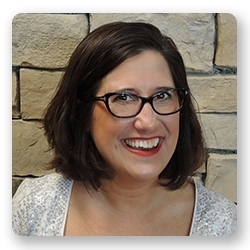 Kim holds a degree in Optometric and Ophthalmic Technology from Owens Community College in Toledo, and has been a licensed Optician since 1993. She is a highly skilled professional who makes shopping for eyeglasses fun! She is also very dedicated to fitting you with the perfect lenses to fit your lifestyle, and ensuring quality from the local labs whom she partners with to bring you premium product. “I love picking out eyewear with people. I see it as a fashion statement. I am blunt and honest- if the frames don’t fit you, or are not flattering, you don’t leave here with them!” Kim welcomes patients to linger and look through the beautiful dispensary with hundreds of fashion frames. She will help you find just the right fit, color and style to complement your face and lifestyle. Patients with outside prescriptions are always given a warm welcome and invited to try on a pair for Kim’s expert opinion. Kim is married to another Certified Optician, Jay, and they have three children who keep them very busy! Kim loves fashion, shopping, cooking, and spending time with her family up north in the Great Lakes region of Ohio. Kim wears Tom Ford frames currently, and is also a big fan of Robert Marc– he was an Optician turned frame designer! To learn about lenses and eyeglass fittings, click here. Marcia, Finance Marcia has extensive experience in the medical field, with over 28 years of service. 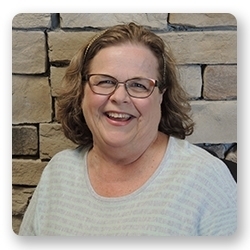 She has been with Montgomery Vision Care since 2009, and is very knowledgeable about insurance and billing. Her expertise means that you can count on her to answer questions about your insurance coverage and she is able to find out the answers to most questions related to billing, coding, Medicare, and HIPAA. “I love solving problems for people and I have an eye for detail. You have to pay attention to details when it comes to insurance and billing!” Marcia lives in Anderson Township with her husband Tom, and she enjoys scrapbooking, reading and spending time with her 11 grandchildren! Marcia wears Koali frames and loves the colorful temples in their designs. 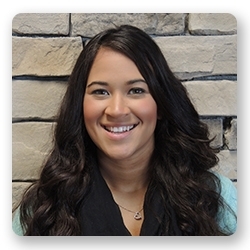 Christina is the Patient Care Coordinator & Billing Assistant. Christina graduated from the UC Blue Ash campus where she majored in Medical Billing and Coding. She enjoys being able to work with the patients, and getting to solve any insurance issues that come her way. She has a niche for organization and loves to organize. Christina enjoys spending time with her family and friends, being outdoors, and crafting in her spare time. 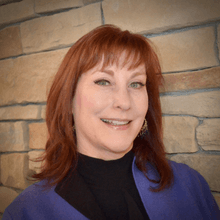 Susan joined MVC in February of 2018 after spending 37 years in the retail jewelry industry. She worked at a “mom and pop” jewelry store while earning her Bachelors degree in Business and Humanities from Golden Gate University in San Francisco. Continuing in the jewelry industry, she spent approximately 20 years as Jewelry Manager at Saks Fifth Avenue. The past 7 years found her at a family-owned, fine jewelry store, before making the career change to the world of optics. She is now studying the world of opticianry under the guidance and apprenticeship of Kim. Susan is married to Scott, who retired from the Cincinnati Police Department after 26 years of serving the Cincinnati community. Married for almost 30 years, they share their lives with their pet cats. Her favorite frames are from Face-A-Face, but she certainly promotes all of the other luxury brands available at MVC. 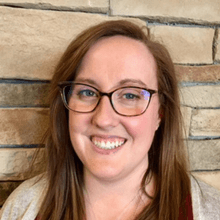 Laura joined the Montgomery Vision Care team in August, 2016. She is a graduate of Little Miami High School and Bowling Green State Univeristy where she received a Bachelor of Music degree. Laura enjoys working her other job with the H2O Church on campus at the University of Cincinnati, singing and spending time with friends. Ali may be the most popular member of the Montgomery Vision Care staff. She is not always at the office, but if you’re lucky your visit will coincide with one of her guest appearances! 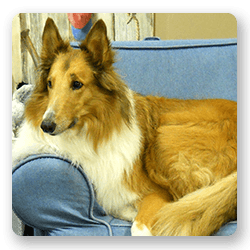 When Ali is not at the office doing paperwork or receiving treats from the mail carrier, she’s fond of playing fetch and napping. Trinity is the baby of the family who joined Montgomery Vision Care in June 2016! 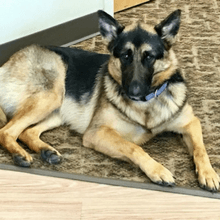 She is an adorable German Shepherd pup who is keeping Ali busy and bringing smiles to all who meet her!